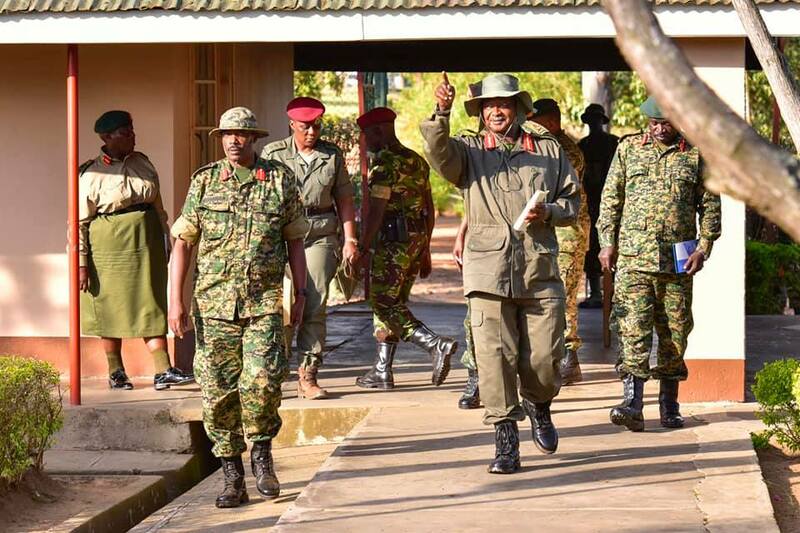 MASAKA – President Yoweri Museveni has commended the Uganda People’s Defence Forces (UPDF) Masaka-based Armoured Brigade for manufacturing de-iodized water and liquid soap that will be used for cleaning their military hardware. “I am very glad that you people have started making de-iodized water and liquid soap. This is very good but you should beef up your team with chemists as the items you are handling are explosive” he counselled. The President and Commander-in-Chief of the Armed Forces, was on Sunday visiting the Armoured Brigade Headquarters in Masaka District where he interfaced with senior army officers and soldiers in Kasijjagirwa village and also commissioned a new facility at the barracks – Kaguta Officers Mess – on top of planting a tree and visiting the stall where the products of the brigade were displayed. He was received by the Commanding Officer of the Armour Maintenance Unit, Maj. Charles Lubega. Maj. Lubega explained that they are at a small-scale production of the de-iodized water for battery topping and a liquid soap that will be used for cleaning their equipment. He added that they plan to increase their production and supply their sister units with the products. He noted that this will cut costs by half when purchasing the same items from the open market. Later, the President assured a joint meeting of Officers and Junior Army personnel of facilities like primary and secondary schools in the sector of education for their biological children. He informed them that the High Command of the UPDF will also look into establishing a university for children of soldiers ‘but will only offer science-oriented courses that are marketable’. On the issue of health, President Museveni cautioned soldiers to take good care of their health on an individual basis. The UPDF’s Chief of Medical Services, Maj. Gen. Dr. Ambrose Musinguzi said the Chieftaincy is emphasizing primary health care in the forces especially on sanitation and personal hygiene; fumigation and the use of insecticide-treated mosquito nets to combat malaria. He added that health facilities in the barracks will also be upgraded and the exercise of immunization against Hepatitis B has already started and will be rolled out to all Army Divisions in the country.